The Mugsy gatcha is PERFECT for fall. 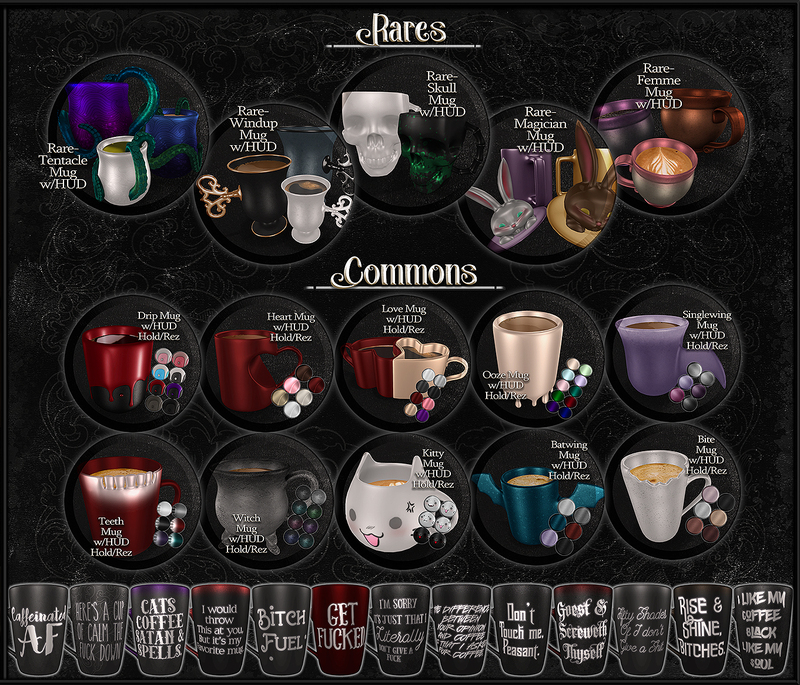 With 5 rares and 23 commons to choose from, every cup is more different and creative than the last. Magician Mug with removable bunny saucer. – HUD changes 10 colors each for bunny and mug. ALL mugs come with a liquid changer, preloaded with 15 different liquids, ranigng from tea, coffee, herbal mate, hot chocolate, foamy cappuccinos, and more to suit your need. ALL mugs come with a wearable AND a rezzable version, and all are modify and low impact. You can get them pretty dang big, and all are nano capable so you can also get them pretty dang small. Check them all out at Shiny Shabby November, and afterwards, at the mainstore! ~ by Vae on November 21, 2016.